Do You Want to Manage Your Online Reputation or Build It? Do You Want to Simply Manage Your Online Reputation or Build It? Most of the time, you can’t get negative reviews taken down. Those sparkling reviews don’t magically appear. Your prospective patients venture online and search for the type of doctor they need. You and your competition appear in their search results with your cumulative star ratings side by side. The star ratings are based upon patient reviews. If you have negative online reviews, you won’t fare well in the comparison, which is a pretty scary thought considering how many prospective patients you may have gained. Even scarier is this scenario: Another doctor referred one of his or her patients to you. Because the patient trusts the doctor, an appointment is scheduled. On the day of the appointment, the patient looks up your address on Google Maps and discovers a nasty review that a former patient left on your Google My Business page. As a result, the patient gets cold feet, cancels the appointment and you lose an actual, tangible patient. Of course, these are just a sampling and each site customizes their own terms, but the key takeaway here is that if the review does not violate one of these rules, the review site WILL NOT take it down. They have adopted a guilty until proven innocent model when it comes to doctors. So if a company is telling you they can get any negative review taken down, they’re lying to you. 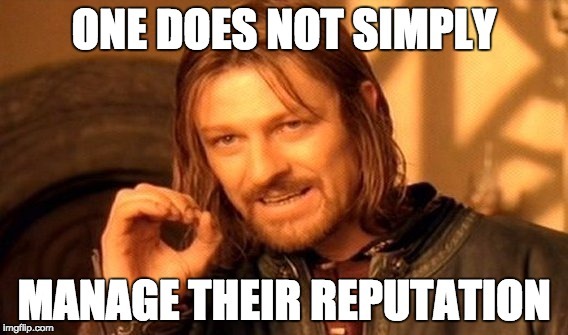 In summation, reputation management provides a passive approach of trying (and usually failing) to get reviews taken down while simultaneously hoping for positive ones. In today’s competitive digital landscape, this just won’t cut it. That is why we recommend Reputation Building to our clients. Unlike reputation management, reputation building is a proactive approach of encouraging patients to leave reviews. This way when you do get negative reviews (and you will get negative reviews because no one is perfect), they are outweighed by all of the positive reviews you have earned. This approach does not mean that you, as a doctor, should beg your patients for online reviews. It doesn’t even mean that your front desk should do it. But it does mean that you should implement a method that reminds patients that they can leave a review online for you if they feel so inclined. This method should also seek to make it as easy as possible for patients to do so. Not everyone is tech savvy – the more effort they have to put in, the less likely they are to do it. Send a follow-up email. I was just on vacation for a week and I’ve received a number of emails from my hotels asking for reviews. The hotel industry realizes that reviews on sites, like Expedia, are their lifeline. In that one sense, the healthcare industry is exactly the same. Be sure to include clear instructions on how to leave a review and include links to your profiles on the review sites. Create posters for waiting areas. Keep the idea of online reviews at the front of your patients’ minds with vivid and colorful graphics in your waiting rooms. Create handouts with instructions. Just like the email concept, patients can take handouts with clear instructions home with them to submit their reviews. One thing that you really don’t want to do is have patients review your practice from your actual physical location. If they are connected to your network, and review sites see reviews streaming in from the same IP address, you can get in a lot of trouble. And here’s something to keep in mind – negative reviews are a given. You will get them. And it could be as simple as one of your patients was just having a bad day, in the mindset of having a negative experience. The secret to dealing with them isn’t getting rid of them. Rather, you drown them out in a sea of positivity. Volume is your solution. If you treat your patients well, the vast majority of patients will have a positive experience. But if you don’t remind them to submit reviews and share their positive experience, you are missing out on a golden opportunity. Let Points Group help you implement a Reputation Building strategy. As a full-service marketing agency with a specialty in digital marketing, we put our creative, content and digital teams to work for you. We’ll create eye-catching posters for your waiting room and convenient handouts reminding patients to review you when they get home. We can even help you set up emails to automatically hit your patients’ inboxes by the time they get home. Points Group can also help you navigate the sometimes-confusing world of medical review sites. We have worked extensively with each of the major sites and are intimately familiar with their terms of service. That means we know not only when a review violates a site’s rules but with whom to work to get it taken down. And for reviews that can’t be removed, that’s where our reputation building strategies come in. As part of our commitment to helping you improve both your reputation and your patients’ experiences, we have partnered with PatientTrak, an innovative reputation management software suite that offers review management, text reminders to patients, online and kiosk check-in, satisfaction surveys and so much more. Points Group can lead the process of implementing PatientTrak software in your practice, so you can focus on what you do best: treating patients. If you want to grow your reputation and your patient base, we can help. Contact us here or give us a call at 973-998-8008.